From the Rock Legends label is the second volume of '' Las Vegas' Voice '', featuring the complete February 3, 1974 Midnight show. 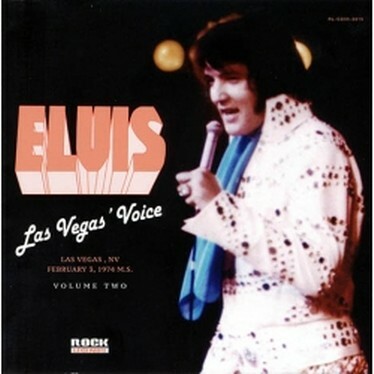 It's not often recordings from Elvis' 10th concert season in Las Vegas were released in such good quality. This show is taken from an unreleased original booth recording and way above average from the standard audience recording. The sound quality is excellent and reveal altogether that Elvis was happy to be back in Vegas, especially with his new contract for appearing only two weeks instead of the usual four weeks up to the August 1973 season. Besides the only released soundboard from the January / February Las Vegas season this is certainly one of the best sounding show ever put out from this engagement. Watch out for the second volume with a complete unreleased show from the very same season ! 01. Introduction: Also Sprach Zarathustra - 02. C. C. Rider - 03. I Got A Woman / Amen - 04. Love Me - 05. Trying To Get To You - 06. Sweet Caroline - 07. Love Me Tender - 08. Johnny B. Goode - 09. Hound Dog - 10. Fever - 11. Polk Salad Annie - 12. Killing Me Softly ( featuring Voice ) - 13. Spanish Eyes - 14. Why Me Lord? - 15. Suspicious Minds - 16. Band Introductions - 17. I Can't Stop Loving You - 18. Help Me - 19. An American Trilogy - 20. Let Me Be There (with reprise) - 21. The First Time Ever I Saw Your Face - 22. Can't Help Falling In Love - 23. Closing Vamp .